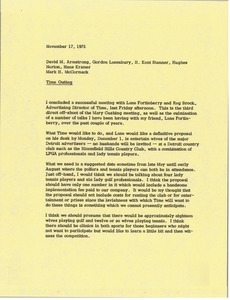 Commenting on a recent encounter with Bob Black, McCormack notes his interest in a tennis fund raising activity and suggests Carter tennis exhibitions similar to a Civitan arrangement. 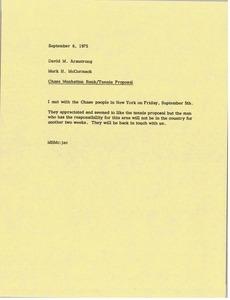 McCormack informs David M. Armstrong that he met with the Chase people and that they appreciated the tennis proposal. 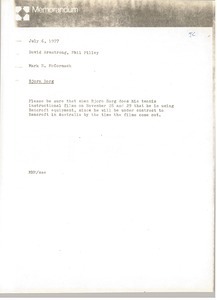 The person responsible in this area will be out of the country for another two weeks so they will be back in touch with them. 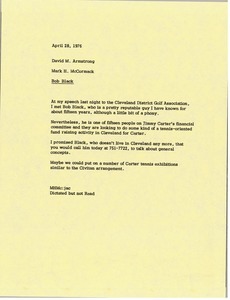 Concerning a Time magazine outing for the wives of major Detroit advertisers at a country club with LPGA professionals and ladies tennis professionals. 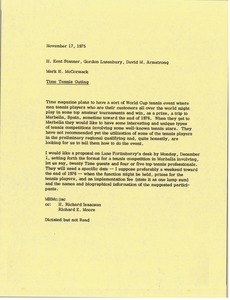 McCormack requests a proposal for Lane Fortinberry containing details of format, participnats, dates and more.